The APC Series will head in to its fourth season in 2018 after a largely successful first three seasons of competition. The 2018 schedule will follow a similar format to 2017, with a few tweaks. 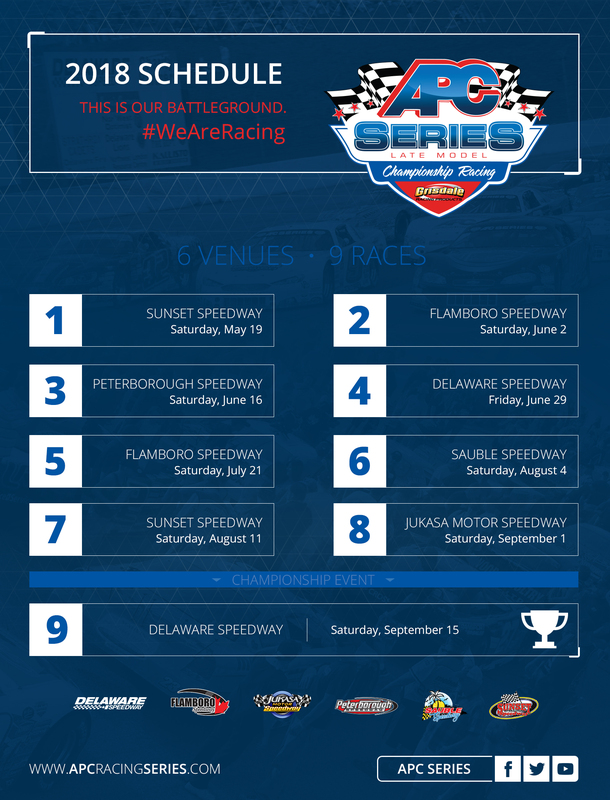 There will be six different destinations over a nine event schedule, beginning at Sunset Speedway in mid-May and concluding with the championship event as part of the Great Canadian race weekend at Delaware Speedway in mid-September. One of the bigger events of the season once again will be the Jukasa Motor Speedway event, this year the event will be held on the labour day long weekend in September and will be part of the new ‘Canadian Short Track Nationals’. The event will be a $5,000 to win race for the APC Series and is sure to attract the who’s who of the APC Series and beyond. The Series will also unveil an all new starting format an increased purse and only minor rule changes for 2018. The 2018 APC Series season official kicks off on May 19th at Sunset Speedway, the venue where the inaugural APC Series event was held back in 2015, and the season has kicked off each season since. The series will make two stops at Sunset Speedway in 2018 with the latter being held August 11th, which will serve as point’s race 7 of 9 on the 2018 championship schedule. 2017 saw Brandon Watson take both checkered flags at the high banked 1/3rd mile in Innisfil, Ontario. Following the opening event at Sunset, the series will then head to the tight and treacherous 1/3rd mile of Flamboro Speedway in Millgrove, Ontario for the first of two stops at the facility in 2018. The first stop being June 2nd and the second being the unofficial start of the second half of the season on July 21st, being point’s race 5 of 9 on the season. Flamboro provided excitement for some and unfortunate heartbreak for others in 2017, the first event was won by eventual champion Brandon Watson and the second event was won by Andy Kamrath, which was voted on by the fans as their second favourite moment from the 2017 season. The third stop for the championship tour will be the lone visit to Cavan, Ontario and Canada’s toughest 1/3rd mile Peterborough Speedway. The event will be held on June 16th 2018 at the famed Peterborough Speedway, home to the Autumn Colours Classic. The 2017 event followed a common early season theme for the APC series and was won by Brandon Watson. Next up the series will celebrate Canada’s birthday weekend at the big, rough, and unforgiving ½ mile of Delaware Speedway with the lone Friday event on the schedule being Friday June 29th. As per tradition the series will head back to Delaware Speedway as part of the Great Canadian Race weekend to crown our 2018 champion on September 15th 2018. 2017 saw multiple winners at the ½ mile with Brandon Watson taking home the Canada day event and 2016 champion Andrew Gresel claiming his 3rd overall Great Canadian race victory. Brandon Watson officially was crowned champion in the 2017 running of the Great Canadian Race, after suffering an electrical issue early in the race. The sixth event of the season will be the annual beat the heat event as part of August long weekend at Sauble Speedway. The event at the beach will be the only stop at the tricky 1/3rd mile located in Hepworth, Ontario. Brandon Watson took the checkered flag in 2017 and claimed the unique surfboard trophy in front of the packed grandstands. “Our APC event, The Spira 100 on the Saturday night of APC Battle at the Beach weekend, is our flagship race of the weekend and it proved last year to be one of the greatest short track races in years,” said Mark Dilley, co-owner of Sauble Speedway when asked about having the APC Series as part of their big August long weekend event. “24 cars going flag to flag for 100 laps in front of a capacity crowd it just doesn’t get any better. As 2018 approaches we at Sauble speedway and our fans look forward to seeing what this year brings to our biggest weekend of the year.,” continued Dilley. Hagersville, Ontario’s Jukasa Motor Speedway will once again hold one of the bigger events in Canadian short track racing for 2018. The APC Series will be a part of the newly formed Canadian Short Track Nationals on Labour Day weekend in September. “As a newly opened facility we are working at establishing some annual events and we feel this will become a must see for teams, partners and especially fans from all over. This will be the biggest oval Stock Car race weekend in Canada and one of the biggest in North America,” said speedway General Manager Alex Nagy when asked about the new event. The event will be held on September 1st and 2nd, featuring the APC series on Saturday the 1st with a $5,000 to win event, while Sunday the 2nd features a non-sanctioned invitational events for Pro Late Models and Super Stocks. More details on this event will be announced by Jukasa Motor Speedway at a later date. 2017 saw Jukasa Motor Speedway reborn again after the former Cayuga Speedway had been left vacant since 2009. New owners Kenny Hill and Jerry Montour as well as General Manager Alex Nagy brought the speedway back to life, and the APC series was a part of the speedway’s grand reopening. The series held twin 75 lap events, both won by Jason Hathaway, in front of a crowd in the 7,000 range. The largest crowd, field, and purse in series history was voted on by the fans as their favourite moment of the 2017 season. The APC series will also unveil a new starting format in 2018. The first event of 2018 will remain a top 5 pill draw as per 2017 rules, and all remaining races in 2018 will follow the new format. This new format will see an inversion of the top 10 based on points. Any car that qualifies in the top 10 and does not have 100% attendance will start behind the cars with 100% attendance. Only the top 5 from qualifying receive points, there will be no change from 2017 in regards to points. The 2018 APC Series season will be one to follow with some big events throughout the summer and some new changes to make things even more exciting. Stay tuned to www.apcracingseries.com as news regarding 2018 is released all winter long.